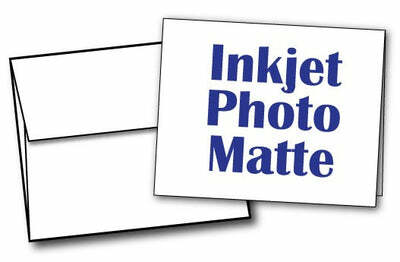 White Half Fold (4 1/4" x 5 1/2") Greeting Cards & Envelopes for Inkjet Printers are the perfect letter writing combination. The greeting card paper, made from 90lb cover cardstock, measures 8 1/2" X 5 1/2", and folds to 4 1/4" X 5 1/2". The matching A2 envelope is made from a quality 24lb bond stock - perfect for holding the contents inside!